So, your home is in need of some repairs. Nothing too dramatic, you would really like to install impact resistant windows, perhaps a new energy efficient air conditioner or maybe you’re tired of dealing with the periodic leaks when the driving rain exploits your 30+ year old roof. The problem, perhaps you’re on a fixed income or your credit score hasn’t recuperated from the economic downturn. But the person ready do the work on your home tells you not to worry. The PACE program will provide you with the funds you need and your credit history will have less weight than your payment history and home equity as opposed to going to your local bank to obtain a home improvement loan. So what is PACE and how can you be sure you are using the program effectively? 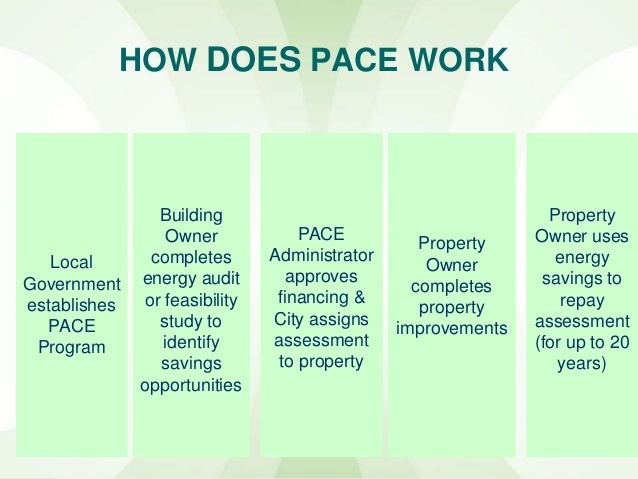 PACE stands for Property Assessed Clean Energy (PACE) and it provides qualified property owners in subscribed communities (including most of the Palm Beach County communities) with a vehicle to finance energy efficiency, renewable energy and wind-hardening improvements through a long-term property assessment. This is a mouthful so let’s unpack it a bit. Securing funds through the PACE program is similar to obtaining funding from your local banker. Cash can be secured for qualified home improvements with the expectation by the lender that the loan will be repaid along with an agreed rate of interest. There is no “free lunch” here. What you borrow will be repaid or you will find a lien placed on your, presumably, upgraded residential property. 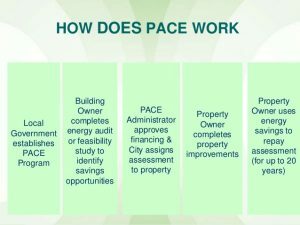 The Florida, Legislature has identified “Qualifying Improvements” for which a homeowner can apply for PACE funding. The improvements include energy conservation and efficiency improvements, which reduce consumption through conservation or a more efficient use of electricity, natural gas, propane, or other forms of energy on the property, including air sealing; installation of insulation; installation of energy-efficient heating, cooling, or ventilation systems; building modifications to increase the use of daylight; replacement of windows; installation of energy controls or energy recovery systems; installation of electric vehicle charging equipment; and installation of efficient lighting equipment. In addition, renewable energy improvements qualify including installation of any system in which the electrical, mechanical, or thermal energy is produced from a method using one or more of the following fuels or energy sources: hydrogen, solar energy, geothermal energy, bioenergy, and wind energy. Finally, wind resistance improvements, which include: improving the strength of the roof deck attachment; creating a secondary water barrier to prevent water intrusion; installing wind-resistant shingles; installing gable-end bracing; reinforcing roof-to-wall connections; installing storm shutters; or installing opening protections. So far, this sounds pretty simple. But (why is there always a but), some homeowners are learning this isn’t free money and sooner or later the money must be repaid (and the longer the loan remains outstanding the more the cost of financing). If the improvement is going to reduce the home’s operating expenses, with some discipline, the savings can potentially be the source of funding for repayment. Getting the loan is generally as easy as demonstrating sufficient equity in the home to guarantee repayment and a history of making your mortgage payments. Homeowners with a good credit history and adequate equity would likely be better off refinancing or securing a homeowner’s equity loan (second mortgage). But if that is not a viable alternative, prudent use of the PACE funding program will avoid regrets in the future. An absence of federal protections are leading to complaints that elderly and low-income property owners are being targeted by third-party contractors for expensive improvements and being extended credit they cannot afford to repay. 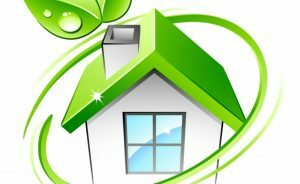 Although home energy efficiency is important, PACE mortgages lack consumer protections, have few checks to ensure that energy savings are real and cost effective, and are inappropriate for homeowners who may be eligible for free or lower cost programs. So the homeowner needs to make an informed decision before contemplating this source of funding to update a residential property. Clearly, many homeowners will find this to be a simpler process than qualifying for a traditional mortgage. If an alternative is available, weigh the costs and the impacts on your property and make an informed decision. PACE can be an essential funding source for homeowners seeking to update their property. A clear understanding of the repayment schedule, rate of interest and potential for the PACE lien to be placed on the property (making sale or refinance difficult) should be carefully considered before signing on the dotted line.